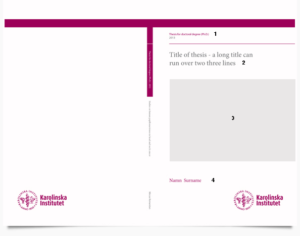 PDF format: Inlagor och andra textfiler måste vara i PDF format. Glöm inte att sätta ”Printed by E-Print AB 2018” på tryckortsidan, lämpligast under ISBN nummer. Day 1: Submit your print-ready thesis via the form on the left. Day 2: Pick up your proof in our store. Day 3: If you need to make changes after checking the proof, e-mail the complete thesis once again. Remember to include your order number. You will then receive a new proof as a PDF. Day 4: The production starts after your OK.
Day 5-9: Production of your thesis. Day 10: We deliver your thesis or you can pick it up in our store. NOTE! When ordering, you need to provide KI ID to E-Print. Please proof-read your thesis carefully before submitting for print. The proof is made in order to check picture quality – and not for checking the spelling etc. We need your file in PDF format. Images should have a resolution of at least 200 dpi (px/inch). PDF: Inlay and other text files must be in PDF. Do not forget to put ”Printed by E-Print AB 2018” under the ISBN number. We can also assist you with business cards, letterheads, envelopes, flyers, postcards, leaflets, books, reports, flyers, posters and roll-up.